Geeks and sports together? It’s a beautiful thing. Well, at least that’s what ESPN is hoping with the announcement of its brand, spanking new Developer Center, which marks the first time that it will open its doors to third-party developers and provide access to its enormous array of editorial content, stats, and other data. As Y Combinator Founder Paul Graham tweeted recently, APIs are self-serve business development. Many startups are catching on to the business development catalyst that APIs can be, but certainly few would say that ESPN, the self-tagged “world leader in sports,” needs as much help in that department as the many startups out there just trying to get off the ground. That being said, this marks a big step forward for ESPN, and all those entrepreneurs and developers who have been itching to gain access to ESPN’s content. As one would guess, the sports behemoth’s new Developer Center is a web resource that allows developers to join the company’s API program for the purpose of gaining access to ESPN data to create new web and mobile apps for the rabid, sports-consuming public. As part of the launch, ESPN is making its “Headlines API” available to the public, which will allow third-parties to tap into the site’s daily news stories and headlines, find content related to any ESPN story, create a “Top Stories” summary, etc. The Developer Center also includes a Research Notes API, which is now only available for strategic partners, giving them access to ESPN’s archive of facts and figures compiled by the stats geeks in the ESPN Stats and Information Group. It will also be launching several other APIs in private beta (only for select partners at this point), including its Scores and Schedules API that provides start times, venues, competiros, scores, and stats across every major sport, as well as a set of other APIs that offer standings, team, and athlete information. Developers looking for access to an ESPN API can head over to the Developer Center now to request a developer key. access to an ESPN API can now go to the ESPN Developer Center and request a developer key. 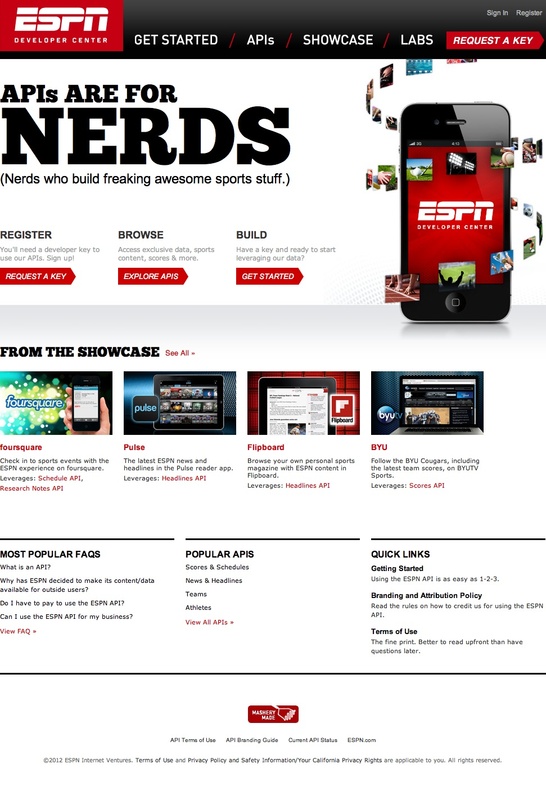 The ESPN crew will be at SXSW to meet with developers and give a tour of its new resources. The launch of the Developer Center, Jason Guenther, Vice President of ESPN Digital Media Technology, tell us, is the culmination of 7-months of effort. The Developer Center has been in private beta since last fall, in testing internally and with a few select partners. Foursquare, one of these early partners, has been testing ESPN’s Research Notes API, allowing its users to check in to sports-related events to receive relevant factoids powered by ESPN. What’s more, as MG reported back in August, Pulse became one of the first partners with which ESPN syndicated its content — other than its own, and the team tells us that Pulse — as well as Flipboard — have been instrumental as early adopters in helping to test its Headlines API while in beta. Chris Jason, director of ESPN’s API program, and Guenther said that its new Developer Center is “fundamental to its business strategy going forward,” and that they view its API program as “transformational.” And that’s not only because third-parties will be able to access its data to create a mind-numbing array of sports apps replete with ESPN data, but to ESPN’s internal development as well. The company now has one distinct resource it can point to when asked about its data resources, both internally and externally. ESPN has been hosting a number hackathons to give developers an opportunity to access its data and create cool, sports-related apps, which you can check out here. The team said that it is going to continue to pushing forward with its APIs, and will at some point in the not-so-distant future be launching a “Labs” section that will list products and product enhancements, and give fans opportunities to weigh in on what types of products or features they would like to see become part of the ESPN app ecosystem. But, for now, ESPN is just concerned with lowering the barriers to innovation, and when asked about its plans for the future, Jason said, “first and foremost is to set our content free.” And what’s better than free data? Branding. All Apps must include an approved ESPN trademark, logo or other intellectual property (each, an “ESPN Mark”). Advertising. No advertising or sponsorship of any kind may appear on or be associated with any App (unless included in the Content made available by ESPN). No Charge. All Apps must be offered free of charge to download or otherwise access and may not contain any in-App purchase features.